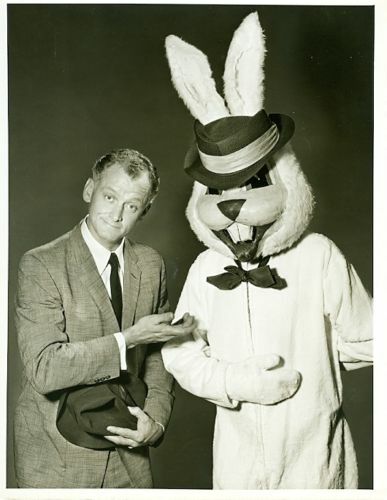 ART CARNEY in a deceptive publicity shot for the DuPont Show of the Month presentation of “Harvey.” The rabbit does not appear in the program. I recently joined a Facebook group devoted to The Honeymooners, and one of the discussion strings included a reference to the fact that Art Carney had appeared in a television production of Harvey,a play published in 1944 by Mary Chase. The play ran on Broadway for more than 1700 performances and won the Pulitzer Prize for drama in 1945, which might have been more understandable at the time than it is now, particularly in view of the fact that one of the plays the Pulitzer jury passed over was Tennesee Williams’ The Glass Menagerie. 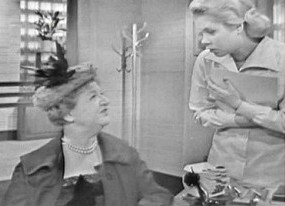 There have been many adaptations of Harvey, and the first one done for television was the production that Carney appeared in in 1958.The production was performed live as part of a series known as The DuPont Show of the Month. The story focuses on Elwood Dowd, played by Carney, a man who lives on a large inheritance and shares his home with his sister, Veta Louise Simmons, and her unmarried daughter, Myrtle Mae. Although Dowd for a large part of his adult life was a conventional man who was widely admired in his small home town, he has now become notorious for claiming as his best friend, and introducing to anyone who will listen, an invisible six-foot-one rabbit named Harvey. 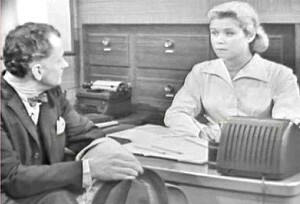 His behavior disrupts Veta’s efforts to maintain some standing in society and Myrtle Mae’s hopes of attracting a beau. They attribute Harvey’s “existence” to Dowd’s habitual drinking. Veta’s agitation is worsened by the fact that she imagines she has seen Harvey once or twice herself. Goaded by Myrtle Mae, Veta decides to take decisive action and have Elwood committed for treatment of mental illness, and the action of the play is generated by that decision. Jack Weston, one of the most versatile actors of his era, plays Wilson, the amorous orderly at the sanitarium. Loring Smith, a fine stage actor, plays Dr. Chumley, director of the sanitarium, and the great character actress Ruth White plays the sympathetic Mrs. Chumley. For a kinescope, the quality of the DVD is not bad, and it has some historical interest because it includes some elaborate promotional ads for DuPont as well as commercials for Piels beer (with Burt and Harry) and Parliament cigarettes. I choose how I will spend the rest of my life.